The Afghan Women’s Support Forum is an independent alliance of individuals who are committed to helping Afghan women enjoy the health and freedoms that will enable them to reach their potential. All members are volunteers and while AWSF members give freely of their time and skills, they do not constitute a registered charity and have no access to funds. “Any kind of discrimination and distinction between citizens of Afghanistan shall be forbidden. BBC News now reaches more than 60 percent of adults in Afghanistan. Read more and access links HERE. A report by Charlotte Bellis in Kabul for Al Jazeera. Copland? A town in Afghanistan for female police officers. In an effort to encourage recruitment, the government is preparing an entire town of secure housing for female police officers and their families near Kabul. For the first time, Women for Women International has begun to provide graduates with advanced training in leadership and advocacy skills through a dedicated three-month programme. Victims of the security situation – The past year was a particularly deadly one for journalists in Afghanistan. At least 15 journalists and media workers were killed, many in targeted attacks on the media. By sowing terror in some regions, the Taliban and Islamic State militants have created information black holes. In some provinces, the Taliban forced the media to pay arbitrary taxes that were tantamount to ransoms. Many governors and local officials are meanwhile unable to accept the principle of media independence, and the police and military have been implicated in several cases of violence against journalists. The decline in security has had a direct impact on the number of women working in the media. Many of them have been forced to abandon their work because of growing threats and the climate of violence they face. Read more HERE. The Farkhunda Trust 20th March 2018 event on the occasion of Nawruz and International Women’s Day was a great success! Many members of the Afghan community and Afghan youth came out in large numbers to join our IWD and New Year event to support Afghanistan and its young women. On behalf of all Farkhunda Trust Trustees, Ambassadors of Support and colleagues, I would like to extend our deepest gratitude to the First Lady of Afghanistanforher excellent message to the Farkhunda Trust event supporting Afghan women’s education.I would also like to personally extend my incredible appreciation to our Farkhunda Trust Ambassadors of Support for their contribution and continued commitment to support their disadvantaged and talented sisters back home.Thank you to all our amazing speakers (Jawed Nader, Najiba Lema Kassrae, M. Asif Noorzai, Agile Rahmani Kamini Paul & Royan Khaeri), the entertainment team (Alia jaan Ansari and her team), the Kabul Salon – Mari Ahmadi and her team – and our diverse community members in the Afghan Diaspora including our Afghan Sikh and British friends for their direct debit and support of £1-£10 per month for the next 5-10 years and some even for life! Read full story about their police training HERE. build a new and prosperous Afghanistan that can compete on the world stage. The first 2018 meeting of the Afghan Women’s Support forum will take place on Wednesday 21st February at 1630hrs. The AWSF condemns the attack against @Save_Children office in #Jalalabad #Afghanistan, and extends its condolences to all affected. According to Save the Children it has helped more than 700,000 children in Afghanistan over its years of operations. Choose a beautiful Christmas gift for a loved one and support Afghan artisans at the same time. Handmade gifts by NOQRA are individual pieces that often reflect a level of skill, passion and creativity that cannot be replicated in manufactured products. Many handmade pieces also have interesting stories behind them, whether about how they are made, who they are made by or their influences. These items are crafted with love and passion by young Afghan artisans from the old city of Kabul. Noqra jewellery began as two ideas shared by two sisters. They dreamed of designing and selling jewellery that not only highlights the beauty of naturally-occurring Afghan gemstones, but also supports the Afghan economy by employing local Afghan jewellers. After much study in fashion, design and business, in 2016 the sisters were able to make their dream a reality with the launch of Noqra. Read more HERE. Oxford platform for girls education advocate. 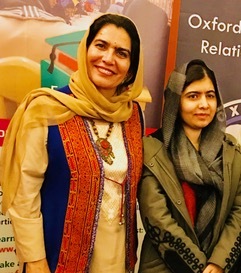 Farkhunda Trust founder Rahela Sadiqi joined a panel of speakers in Oxford on November 20th to discuss the impact of aid on development in Afghanistan – and the vital importance of education for girls. At the invitation of the Oxford International Relations Society she joined Dr Michael Ryde and journalist Bahar Joya in a discussion chaired by Professor Sue Doran. “Dear AWSF members, It has been a year since I met you all, and since then I have been on an incredible and extremely challenging journey. I moved to the United States and embarked on a journey in the tech industry in Silicon Valley. A 5K Charity Fun run organised by Afghan scholar Walid Hakimi and supported by The Farkhunda Trust, raised £250. The money will be used by The Trust to help give Afghan girls access to Higher Education.More than 30 spectators cheered on the 20 runners who were split into groups of two, three and four – including women and children! Other volunteers helped out at the three hour event by selling food an drinks. The Trust expressed special thanks to Samsor Faize, Director of the Afghan Social Club, and Roya Farhang, Manager of Women’s Affairs at the Afghan Social Club, for their support before and during the event. It will be the first time Afghanistan, who are currently seeking test nation status from the ICC, has played at Lord’s and the MCC will be putting out a very strong, international star-studded team captained by Brendon McCullum. *See how cricket projects have reached 22 provinces in Afghanistan HERE. The five Farkhunda Trust scholars who will be studying at Dunya University in Afghanistan this year received their free laptops last week in a special ceremony led by the Vice Chancellor of Dunya University, Mr Ahmed Shah Sankdel. As part of the Farkhunda Trust’s scholarship programs, students are able to attend university for free in addition to receiving the tools and support they will need to succeed at school. These include a laptop, stationary and textbooks, mentoring, workshops, transport and lunch. For full story click HERE. Women for Peace and Participation is launching a ‘United Women for Peace’ initiative – to advocate for change and inclusion. The event will introduce diaspora women leaders in the UK from conflict and post-conflict countries to present a case highlighting the importance of including women in processes building their way to an inclusive peace processes. In recent years, diaspora women have also had a considerable degree of influence on policy agendas and the development of their home countries. Many women in the diaspora, who have directly been affected by war and have fled their home countries due to personal security issues, possess unique skills and first-hand experience of the local and global context. Among them, those, who have high level knowledge, experience and understanding of the ways international policies and frameworks work are best placed to influence policies in favour of women in the war affected countries. Please register through the Eventbrite link HERE. NB – The item is broadcast approximately 16 minutes into the programme. Members of the Afghan Women’s Support Forum who met in The House of Lords on Wednesday 22nd March were among those locked down for several hours while a terrorist incident was investigated. We would like to offer our thanks to the police and security forces who looked after us and our heartfelt sympathy to the families and friends of the innocent dead and injured. As part of its effort to encourage a culture of education and advancement based on the notion of world citizenship, Persia will raise funds to establish spaces for training and education, help publish books, assist in construction of libraries and institutions of higher education.In addition to significant populations of Persian-speakers living in Asia, many reside in the United Kingdom, Europe, the Americas, Africa and Australia. The Foundation, a UK-based charity, promotes education and advancement opportunities for underserved communities.There are more than 110 million Persian-speakers around the globe, the majority of whom are women and girls in need of education in order to improve conditions for their own self and societies. On the second anniversary of the London Vigil held on 29th March 2015 in honour of Farkhunda Malikzada, a young female student brutally murdered on the streets of Afghanistan, the Farkhunda Trust, with the support of the SOAS Afghan Society, will be holding a presentation, video and discussion on its current efforts to support exceptional young women from deprived backgrounds attain their higher education. AWSF members and supporters who would like to attend the event should click HERE. The presentation will be delivered by the Farkhunda Trust’s group of young volunteers who are eager to support their counterparts in Afghanistan to create a network of independent and politically and economically engaged professional women. For more information click HERE.The event is an awareness raising campaign to support the higher education of young women in Afghanistan. It is also a part of the Farkhunda Trust’s “Empowering Women with One Pound a Month” campaign to help send Afghan women to university. It has been proven time and time again that when you educate and empower women, their countries prosper. Our ambition at the Farkhunda Trust is not only to provide young women with a college education but also to mentor and support them and to create a network of active, ambitious, and professional women in Afghanistan that engage in the social, economic, and political life of the country.With as little as one pound per month, you can help talented but disadvantaged women in Afghanistan complete their university degrees and achieve their dreams. Please feel free to join our campaign, by clicking HERE. There will also be an opportunity to donate at the event itself! The Farkhunda Trust is run by a group of committed, professional volunteers, which means that your donations will benefit Afghan women directly. Still, while many women scoff at the gift of head scarves, at least, they acknowledge, they are not being given burqas. Read more from Zahra Nader, a Times reporter in Kabul, HERE. Sharbat Gula returns to her own country. Noqra jewellery began as two ideas shared by two sisters. They dreamed of designing and selling jewellery that not only highlighted the beauty of naturally-occurring Afghan gemstones, but also supported the Afghan economy by employing local Afghan jewellers. After much study in fashion, design and business, in 2016 the sisters were able to make their dream a reality with the launch of Noqra. Conceptually, Noqra jewellery is characterised by clean, refined lines, mostly wrought in silver—pure elegance. But at a deeper level, their intention to benefit people who have suffered is a pure one too. This is what impelled the sisters to name the line Noqra, or ‘silver’ in Persian, because to them, silver is a symbol of purity. Sahar’s Success: Journalism training charity gives Afghan woman voice on world stage. This is a huge, historic victory, both for Sahar Speaks and for Afghan female journalists: she is the first Afghan woman to have a byline in the mainstream media there. Twenty-six-year-old Zahra has a 2-year-old son, has never left the region and is her family’s sole breadwinner. She has dreamed of being a journalist since she was a child. Without the training, support and mentoring given to her by Sahar Speaks, she would not be where she is today. andThe New York Times would not be publishing stories by Afghan women. We are now raising money to support the current trainees, and for a second round of Sahar Speaks, which we hope will take place in the autumn. We are a very small operation, meaning every donation goes far. We would really appreciate it if you can help — by donating, or spreading the word. Published on 6 Apr 2016 – Afghanistan’s first lady Rula Ghani discusses the state of women’s rights and freedom in her country. She joins the stage with New York Times columnist Thomas Friedman during the 2016 Women in the World Summit in New York City. In June 2015 UK Progressive ran a feature about the lack of breast cancer care and awareness in Afghanistan (Read HERE): It recorded the interest expressed by H.E. The First Lady, Mrs Rula Ghani, in addressing the situation. It also described the embryonic first steps towards formation of an organisation that would facilitate prevention, early diagnosis, treatment and palliative care for those currently denied information or access to medical help. The subject was brought to life through the experiences of two Afghan women – an Afghan MP (Shinkai Karokhail) who had suffered from the disease and London-based doctor (Dr Zarghuna Taraki). It was further publicised through The Afghan Women’s Support Forum (AWSF). – Read more HERE. Writing exclusively for the AWSF is Quhramaana Kakar, a leading figure in Afghanistan working for women’s empowerment in the areas of leadership development through political participation in peace building and Women’s Economic Development. See her full article HERE. Quhramaana works hard to represent the most vulnerable and deprived group of Afghan women and youth. She is the former Gender Advisor to Afghanistan Peace and Reintegration Program. As N-Peace 2012 Role Model for Peace awardee, she currently provides support to UN peace-network as advisor on the strategic board. She is founder of the Women for Peace and Participation and has also been advising policy makers and politicians in Europe and US on international intervention in Afghanistan. Quhramaana also worked as Deputy Chief of Party for USAID’s higher education development project in Afghanistan and has worked with several international organisations on senior management level on programs focused at women’s empowerment. She holds a Master’s Degree in Business Management and M.Phil in Economics and Management from University in Pakistan, a Master’s Degree in Public Policy from Germany. She she has recently completed an M.Phil at the University of Cambridge. Victoria Schofield paints a verbal portrait of Shabana Basij-Rasikh, (pictured) the inspirational President and Co-Founder of SOLA (The Afghan School of Leadership). SOLA believes that educating girls across Afghanistan’s provinces, religious sects and tribal affiliations is the fastest way to increase female participation in political life, and to raise the educational levels of all Afghans. Conceived in 2008 as an English-immersion boarding school for Afghan students, today SOLA has 28 female students from 14 of Afghanistan’s provinces representing all major ethnic backgrounds. Forty-five alums of SOLA have gone on to secondary and tertiary scholarship opportunities at boarding schools around the world. Read full article in The Guardian HERE or on this site HERE. Women for Women International – ‘Afghanistan Week’ (22-26 February). Women for Women International invite you to an exclusive screening of ‘Frame by Frame’, directed by Alexandria Bombach and Mo Scarpelli. Starring Pulitzer prize winner Massoud Hossaini and award-winning Afghani documentary photographer and photojournalist, Farzana Wahidy, ‘Frame by Frame’ follows four Afghan photojournalists as they navigate an emerging and dangerous media landscape reframing Afghanistan for the world, and for themselves. Women for Women International will be hosting an online Q&A with one of our colleagues from Afghanistan. More information will be available on our website soon. 2015 marked an important year for Afghanistan’s transition following the newly elected government and the drawdown of international forces in 2014. This parliamentary briefing will explore the lessons from 2015 from a women’s rights perspective and identify recommendations for the UK to effectively support women in Afghanistan. We will be joined by colleagues from Women for Women International-Afghanistan, who will present insights based on their experiences in one of the most difficult countries to be a woman where we have worked with almost 50,000 marginalised women since 2001. Speakers include: The Rt. Hon. Baroness Anelay of St Johns DBE, Minister of State at the Foreign & Commonwealth Office and Prime Minister’s Special Representative on Preventing Sexual Violence in Conflict; Mandana Hendessi OBE, Country Director, Women for Women International-Afghanistan; Quhramaana Kakar, Gender Advisor to the Afghanistan Peace and Reintegration Program and Joint Secretariat of the High Peace Council; Dr Pilar Domingo, Research Fellow, Overseas Development Institute (ODI). A sad development – we are sad to highlight a Washington Post report that reveals how Afghan women are being targeted and threatened through Facebook hackers. We can’t stop this, but simple things like not posting personal photographs or details that will identify you, can make you less attractive targets. On Monday, August 16th, 2015 the Outpatients Department of the proposed Oncology Department (the first of its kind in Afghanistan) started its services. This is the first big step towards establishing a comprehensive Cancer Centre within the structure of the Ministry of Public Health. It was made possible by the unceasing efforts of a small but rapidly growing group of people who freely gave their time, skills, energy and passion to making the seemingly impossible, become possible. Afghan Cancer Control Committee Coordinator ( ACCC) Dr Maihan Abdullah has extended his thanks to all involved. A killer disease has united two women living 3,500 miles apart. One is a sufferer, the other a surgeon (below). Until recently they were strangers, but the Afghan Women’s Support Forum brought them together in the wake of a campaign that has now attracted the support of Afghanistan’s First Lady. Read more about the groundbreaking initiative that has resulted in formation of Afghanistan Cancer Control Coalition (ACCC) HERE. Founded by AMEWYS for girls and women who face violence in their communities. For further details and updates click HERE. The traditional celebration of Nowruz (New Year) is celebrated widely in Afghanistan. At its heart is a traditional table setting known as Haft-Seen that features seven foods beginning with the letter ‘s’. Rahela was happily getting ready for the event – cleaning her lovely home, getting special clothes ready for the little children and preparing the festive food. “I wanted 1394 to be different from past years of heartbreak. I wanted it to start with happiness. We had so much to celebrate – our wonderful life, harmonious family and new hope for the future of our country. But then I heard the dreadful news and silently cried NO, NO, NO! I couldn’t stop my self . . . such pain and horror that the last days of 1393 should end with the frenzied killing of young Farkhunda. It ended with blood, dust, and the smoke of Farkhunda’s dead body; the murder of a girl killed by wild and inhuman men who called themselves Muslims but knew nothing about Islam. Some of those people were Taweez (charm) writers from the Shahi Do Shamshira Shrine. Taweez, or Jadogar in Farsi, translates as ‘magic’ in English. The wicked people who write these nonsense charms abuse the name of Allah and Islam, by convincing simple-minded people that such magic will cure sickness or resolve problems for them. Farkhunda was a devout Muslim girl, well educated in the ways of Islam – at 27 she was too young to die! And for what? Simply for trying to persuade women not to put their trust in misleading charms like tawez and jado. Farkhunda did not understand the danger of saying this when surrounded by wild, illiterate people. When a man shouted, “Why did you burn the Quran, why did you burn the Quran?” the cry was taken up by others and there were calls for her to be taken out of the shrine and punished. Suddenly Farkhunda found herself being dragged from the shrine by hundreds of wild, angry men. In minutes that must have felt like hours to Farkhunda, these men dragged her into the street, kicking her and raining blows on her. She screamed in protest that she had never burned the Quran. “No! No! Don’t beat me my brothers, I didn’t burn Quran,” she protested, but there was no one defended her or heeded her screams. She was stamped flat on the dirt floor like a carpet. Blood covered her body but still the depraved crowd beat her with wooden sticks and rocks. Unbelievably this took place in front of a Government security post and was watched by police who stood by and did nothing. Farkhunda’s modest Islamic dress was ripped into shreds and her back laid bare – a final indignity for this innocent girl. These men knew that the body of a Muslim woman should not be exposed, or her head uncovered, but they didn’t care about the rules of Islam. In their frenzy and bloodlust they showed no concern about her headscarf or clothing, only about kicking her defenceless body and causing pain. A car was driven over her blood soaked body, wounded and brutalised by wood and stone; still alive she was tossed into the river like garbage – then most shocking still, she was burned like coal. Farkhunda was not able to move but her broken heart was still beating, as though angels were keeping her alive. But still these cruel men were not satisfied; using their coats and jackets to fuel the flames they built a fire as yellow as the sun and watched as she burned and burned. At last her pain ended and her ruined body was left like a piece of coal at the bank of the river. Farkhunda’s shocking death was a stark reminder to Afghanistan and societies throughout the world, that Governments who claim to stand for justice have a duty to punish such crimes, especially when they involve perversion of religion and the abuse of innocents like Farkhunda. There are no accurate statistics for incidence of breast cancer in Afghanistan but there are many sufferers. Ministry of Public Health officials acknowledge that women who cannot afford to go abroad for treatment lose their lives because of the lack of necessary diagnostic and treatment facilities in the country. The Afghan Women’s Support Forum is campaigning to raise awareness of the issues and help initiate action that will remedy them.For more information click HERE. The Afghan Women’s Support Group sends greetings to women everywhere in support of freedom, friendship and a safer world. In 2007, journalist Heidi Kingstone arrived in Kabul, eager to explore one of the most turbulent corners of the world. Here, she reflects on her four years in Afghanistan – and explains why life is set to change for the women who live there. 7 November 2014. This is one of my clearest memories of life in Kabul. The year was 2007, I had just arrived in the city and spring had come early. The sun shone and women swam in the cold water. Back then even Hamid Karzai’s wife, Zeenat, a gynaecologist, was rarely seen outside the presidential palace. But, fast forward to this September, when the new Afghan leader, Dr Ashraf Ghani, praised his wife, Rula, in public – where she sat prominently beside him. The new First Lady intends to be an advocate for women’s rights during her husband’s term. To many, it looks like the long awaited new dawn. Women’s rights in Afghanistan have long been contested ground. In the Twenties, King Amanullah planned for the emancipation of women – something that was considered so radical it ultimately led to his abdication. Educating girls formed part of the original Nato-Isaf mandate when forces entered the country in 2001. And women’s rights were later enshrined in the new Constitution – but they remain as fragile as the political situation. Insecurity in several provinces has already forced girls to abandon their education. Just a few days ago, the UK ended 13 years of combat operations in Afghanistan and the last troops left Camp Bastion. In a conservative country, where many still oppose women having any role outside the house, progress is dependent on international financial aid. This is already drying up. Women fear losing the small gains they have made (although it was urban middle-class women, rather than poorer families in rural areas, who benefitted). No wonder many are hoping that Rula Ghani’s entrance into the public sphere will lead to change, and a higher status for women. But there is no magic wand. Afghanistan has the dubious distinction of coming top of countries voted worst in which to be a woman. Domestic violence is endemic, and the majority of women are illiterate. That is what drew a huge number of people, like me, to venture to Afghanistan: a desire to help such women. Over the last decade, gender development programmes have mushroomed: women have been employed in NGOs; received scholarships; worked as cleaners, worked as administrators; taken part in a variety of small projects in the home, or in workshops – bringing in extra cash and small moments of independence. But there is also a sense, sometimes, that our view of Afghan women is a bit like a modern day version of the circus freak show. In the northern part of the country, I once interviewed a very old woman who had one tooth and long grey plaits that poked out from her headscarf and hung down her back. The fierce Afghan sun and a long hard life had weathered her skin. We spoke through a translator. She had been a beneficiary of a small project that improved the quality of the fruit and vegetables she grew in her garden and sold at market. It was low-tech stuff – just some kit to keep insects from eating the produce. Of course, I remember her smile when she talked about the impact this had made on her life. But what I really remember is her words when she told me how she’d learnt that women could work outside the house and had value. So, was Britain’s endeavour worth it for women? Yes and no. We built a false economy, inadvertently made many corrupt people rich, and made many promises we couldn’t keep – not least changing the lives of women. The narrative on Afghanistan is changing here – as is the collective feeling about involvement in far off places we really know nothing about. “There is a frantic scrabbling for some kind of legacy of success amongst the senior British military,” says Frank Ledwidge, author of Losing Small Wars – about military failure in Iraq and Afghanistan. “They realise that their spinning and lying is going to catch up with them. The line now is ‘Helmand may be a mess, but at least the rest of the country has not descended into total chaos’. The place that I called home for more than a year is fast disappearing. Against a backdrop was war, the fabulous Kabubble offered a great network of fascinating people, crazy parties, bizarre occurrences and Afghan hospitality. It was a country at the crossroads of history. My book, Dispatches from the Kabul Café, chronicles this era from the perspective of an expat (me). This was a unique moment in time; where restaurants, five-star hotels, bursts of artistic creativity and hope flourished side-by-side with death and a pervading sense of imminent doom. That has already started to fade. Friends and colleagues have left, including myself, moving on. Others were murdered by the Taliban. But I think we all treasured our time there. Afghanistan takes hold of the soul. Journalists are programmed to be cynical, often for good reason. There was so much hope in the beginning but Afghanistan has proved a tough country to change, despite its many wonderful young and educated people who are working for a better future – especially for women. Can Mrs Ghani help? That remains to be seen. During the last 30 years, Afghanistan has been affected by conflict in many ways. One can hardly find an Afghan family which has not lost one or more members in this period due to conflict. Over one million people have been killed, one million are disabled and millions either migrated abroad or are internally displaced. Conflict and other factors such as unemployment, general poverty, breakdown of community support services, and inadequate access to health services have not only damaged the social infrastructure of the nation, but also caused mental health disorders mostly in vulnerable groups like women and disabled people. Half of the Afghan population aged 15 years or older is affected by at least one of these mental disorders: depression, anxiety and post-traumatic stress disorder. These disorders add to community and domestic violence and to the high levels of malnutrition in the country as they undesirably affect maternal care giving in various ways. Furthermore, social restrictions and taboos are big challenges for women’s access to mental health services in Afghanistan. Postpartum depression has been associated with antenatal depression, young maternal age, single maternal status, cigarette smoking or illegal drug use during pregnancy, hyperemesis gravidarum, high utilisation of emergency services and sick leave during pregnancy and previous affective disorders. Surveys conducted by national and international organizations indicate that 66 per cent of all Afghans are suffering from stress disorders and mental problems. Mental illness presents significant risks to women’s lives worldwide. Mental disorders are no less common in pregnancy than at other times in a women’s life. Anxiety and depression are common, and women with other significant mental disorders, such as schizophrenia, bipolar disorder are at greater risk of compromised maternity care, delivery complications and relapse in pregnancy and postpartum (post-delivery) period. A regular budget allocation does not exist for mental health. It is clear from the above that Afghanistan still has a long way to go in the way of improving the serious concerns with the treatment of mental health especially in the case of women. Five years later we have concerns that far from seeing improvement, this ‘invisible’ issue has become even more taboo. Read the original article Mental health in Afghanistan and watch this space for new contributions to the debate.